Throughout the summer of 2011, the NELA Garden Group met regularly to tend the vegetable beds, and a plan emerged to transform the large south lawn that was covered in Bermuda Grass sod (3050 sq.ft.) into a garden to showcase permaculture techniques, low-water landscaping, and an urban food forest. The project qualified for the Pasadena Water & Power rebate program. the south slope is stabilized with a salvaged concrete (“urbanite”) berm and a low retaining wall along the sidewalk. The Throop Memorial Church Learning Garden project continues to take shape. A group of us met on Saturday, July 16 to talk about the upcoming lawn conversion, pick produce, tend the garden and share conversation. The permaculture rose garden, by the church steps, continues to bloom. The compost tea really inspired the roses to put out many fragrant blossoms. The bees and the neighbors seem very happy with this. The vegetable garden continues to flourish, thanks to many hands, bountiful sun, nutritious earth, and Jean’s dedication to watering. The beans really took off and are well over 6 ft. tall. Fortunately, Connor and Michael expanded the support for them at the end of June, to accommodate their expanding mass. Liz harvested a huge bowlful beans on the 16th. In all we harvested about a bushel of produce; including potatoes, green peppers, hot peppers, snap peas, and yellow squash. All excess food goes to Union Station. Several neighbors and passers-by stopped to chat, admire the garden, and sample freshly picked beans and snap peas. The produce is bountiful, and already draws the community together. The ultimate harvest is enjoyed conversation by conversation. Later, Michael, January & Liz dead-headed the roses while discussing rosehips, jam, medicinals & plans for the garden. Michael & Liz are planning a mini lawn conversion for the old growth roses on the SE side of the church. This will clearly demonstrate the concepts used in a permaculture lawn conversion better than a spoken explanation. Many thanks to all who have focused their energies on the garden. 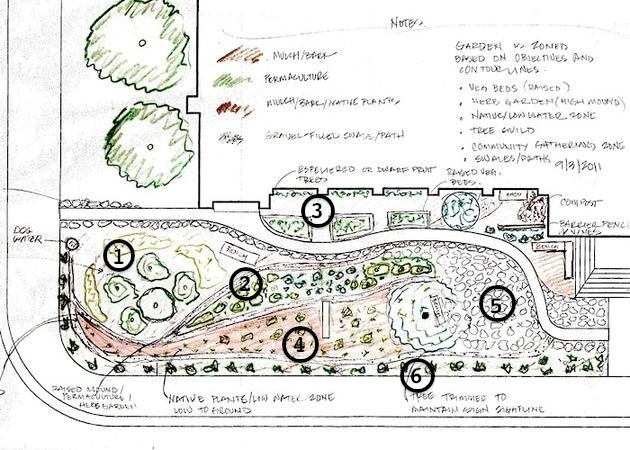 Early draft plan, showing concept for permaculture zone planting and swales. Draft irrigation plan, mapped over final garden map. During the first phase of the garden at Throop Church, NELA Transition volunteers planted vegetables along the south bed of the church, including tomatoes, cantaloupes, summer squash, beans, red bell peppers, and red chili peppers. Spurred by the success of the event, there was growing interest in doing a larger project involving replacement of the lawn with a permaculture garden. A meeting was convened in May to discuss possibilities. Initial reception was positive, and regular meetings were scheduled thereafter. In June 2011, roses were planted in a narrow bed along the main walk-up. The beds were prepared with gravel for drainage, well mulched and fertilized with compost tea.